When Gary and Donna Fischer purchased Wally2, their 1967 Beetle Convertible, they began to put “him” into stock condition. Wally2 had undergone many handlings since he had been pulled from a barn—literally. Questions came to 1967beetle.com where Eric copied the message over to Jay. (We are a quite the team!) Heads together over the Internet, we could not come to any good conclusion. We did agree that some previous owner had a reason for those two holes so carefully drilled and taped. I sent a message with the photos of the Convertible to Richard Marcoux, the owner of one of the finest 1967 Beetle Convertibles in America. Richard examined the photos but remarked that, in his experience, he had not seen any appliance or accessory meant to be installed at that point. The Fischer’s posted a Forum on TheSamba and garnered several responses—nothing conclusive. In desperation, Donna began to pick through photos which they had of the car in earlier years when it had been “rediscovered” in that barn. Mystery solved, Wally2 can continue to deliver his proud new owners and their grandchildren to and from events and the ice-cream parlors. 1st … Wow a new look to 1967Beetle.com; very sleek but I kind of miss the original photo from the masthead. 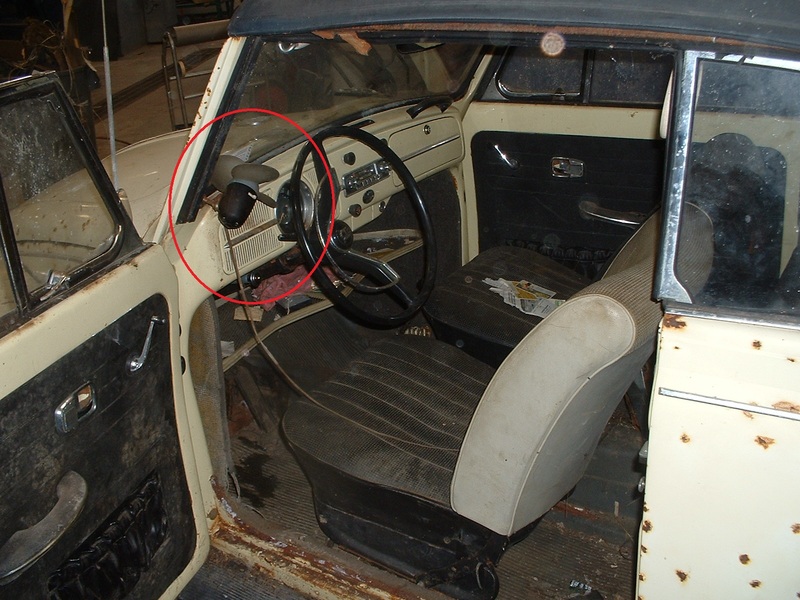 2nd … One responder to TheSamba forum thought the fan cord might have plugged into the cigarette lighter which may account for the missing lighter and for the fact that when a new lighter was inserted, it blew the fuse to the turn signals. But, that’s another story. 3rd … Wally2 would be proud – like donating his body to science, he’s just letting all his foibles hang out to be poked and prodded. Gary & I thank you so much! Yes, we have been working on the back end, as the community is growing. We are also going to be introducing the forum to help grow our effort even more. Stay tuned! Also, a huge kudos to my wife Amanda for her development effort as we continue to grow. Well…finally we are going to hear it for Amanda! Yes, yes, yes! Amanda is right there working diligently to get 1967beetle.com and LaneRussell operating smoothly for all of us out here in the ’67 Community. A BIG thanks to Amanda Shoemaker! Thanks, guys. We are actually making changes a lot today that you’ll continue to see. So, we’re a work in progress over the next 24 hours. I know change can be hard at first, but we have big plans for 1967beetle.com. Stay tuned. Had to run out to the garage and check my own convertible for threaded holes beside the windshield. Original Canadian car and no threaded holes! Luckily. My guess north of the border would be some attempt to clear a frosted windshield using a fan? 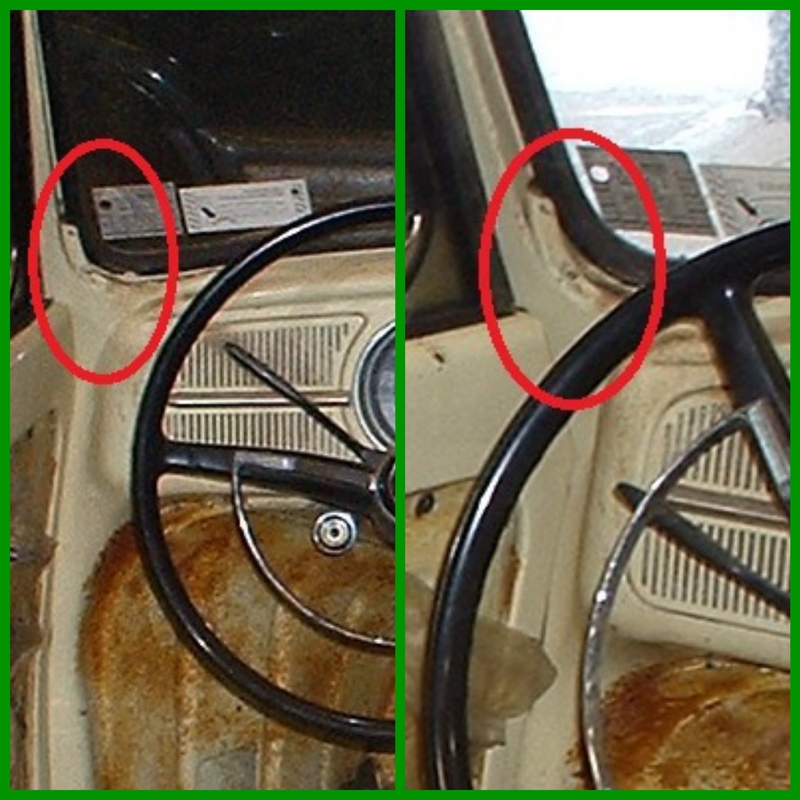 We often had to scrape both sides of the windshield (inside and outside) in frosty weather, as we drove down the road!!! Heater boxes and salt were never a great combination! My ’67 looked the same as the featured vehicle (even the same colour) only in pieces when I started in 1989. (My wife and kids thought I had lost it!) Have driven it consistently from 1992 to date with few issues (and only in good weather as much as possible!) This car has served several family weddings, many outings and even a few “borrows” for weddings. Always intrigued by the modifications that others make as long as they are not too radical. Each Beetle has character but the best will always be the ’67 (the year I got my licence). Thanks Jay and Eric and Amanda for your articles, stories and encouragement. We agree, Tom. If you look closely at the top photo, you can see the fan affixed to the defroster. And, since Wally2 came from Buffalo, NY, the scenario you proposed is likely correct. Wally2 will be glad to hear he has a Canadian cousin. I’m thinking maybe Eric & Amanda will plan a “family” reunion when our beloved cars all turn 50 in 2017. Wouldn’t that be a hoot? Tom Griffin and I have talked about this before. How far would y’all be willing to travel fit such an event? I’d love to do this! Gentlemen — If on the West Coast, likely Wally2 would be there! It might be.. Others have expressed interest as well. Gosh, what have I created? It’s really fun how much this has exploded over the last few years. My wife, who is from the Northwest–Portland, OR-Vancouver, WA, tells me that she was well acquainted with the use of dash fans to clear the windshield inside the car’s cabin. She says that when there was fog, it was a must to have some sort of circulating device at the dash. I suppose that this innovator couldn’t come up with one of the suction-footed fans so he had to create his own base for it. 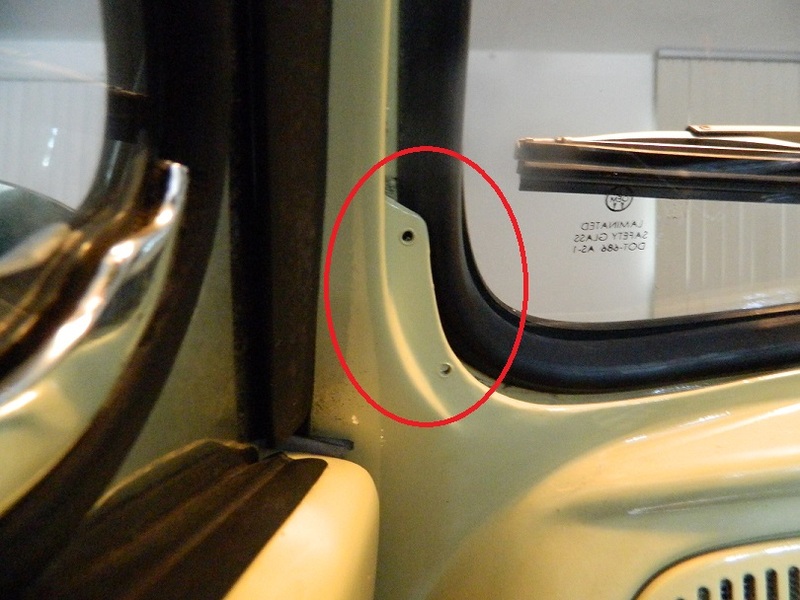 Although, it was usual for these automotive fans to have rubber blades that would not cut a person, you’d think that the fan would have been mounted on the opposite side. I can imagine making a turn and being suddenly whacked hard on the knuckles and losing it in the middle of the turn! LOL-not! I am glad that you and your ’67 ‘Vert found one another and have made not only you happy but, apparently, many others in the doing. Interestingly, Eric Shoemaker just lent his ’67 Sedan to a friend for a wedding. My wife was driven to our wedding in a late ’50s Beetle almost 50 years ago this year! Scarabs are good luck to some cultures–has the scarab a tie with the VW Beetle? Let’s think on that one! I have other ideas as well. I’ll share them with you!